You too can be like this man. Well, he has handlers. There are people who recon for him, so he doesn't end up with a very unhappy time paying alms to the almighty altar of Montezuma's Revenge. 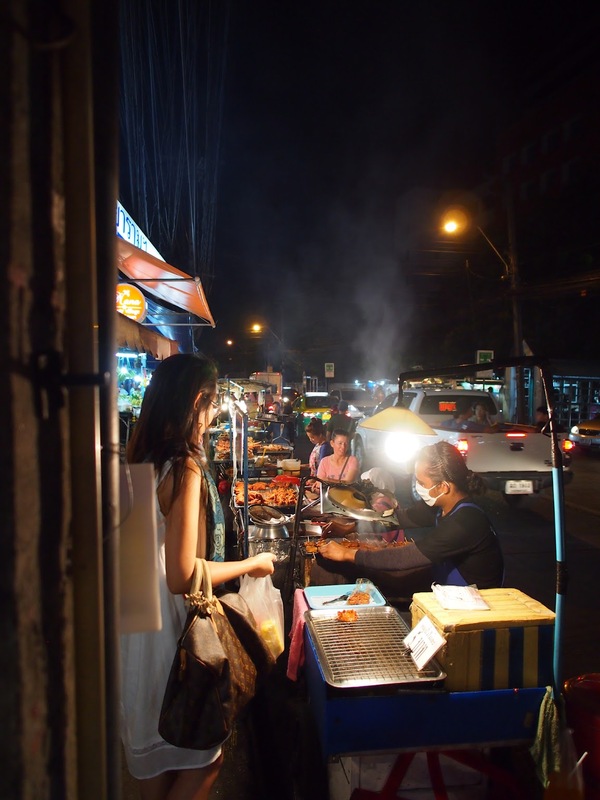 Street food is interesting in SE Asia. I've actually traveled quite a bit in this part of the world. 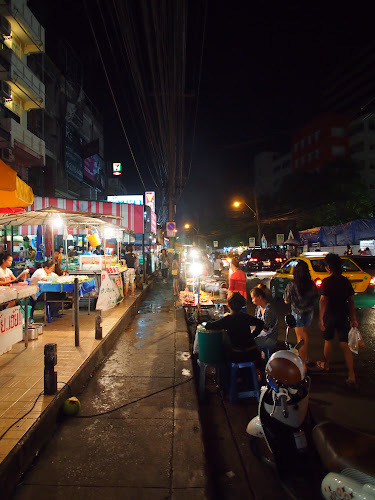 The first foreign place that I visited was not Mexico (actually still never been there), but rather Phang Na, Thailand. That's where the Andaman Ocean Tsunami of 2004 hit. That's when I got drafted to do charity work. That's how I was forced to overcome my fear of flying, and now I fly everywhere. And, I am good at it now. Food is a major part of my travel agenda. Bangkok is pretty safe in terms of foodie adventures. Vietnam, is also very nice. Cambodia, well, that's a little interesting. That's one of the few countries in which I got traveler's sickness. And in Cambodia, I recommend beer. As with all travel, sometimes beer is safer than the water. I wasn't entirely convinced that bottled water in Cambodia was safer than beer. 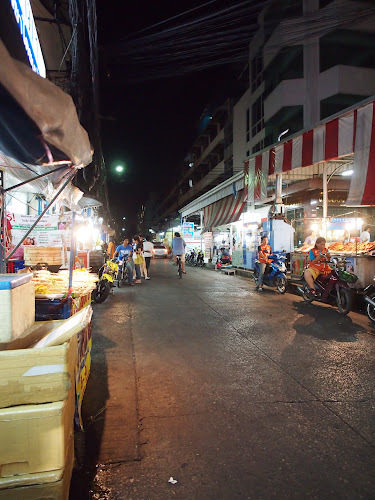 Having been to several parts of Thailand, I have to say that the street food scene of the Ramkhanhaeng area is amazing. 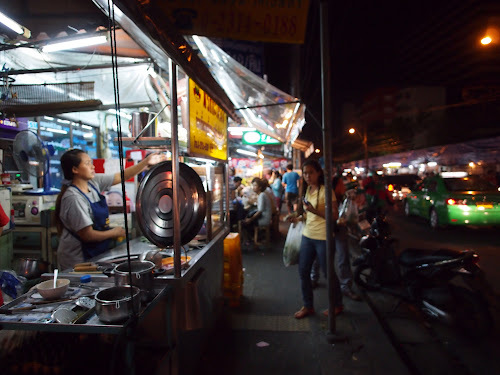 There are many areas of Bangkok with strong street food sections, but nothing really compares to the density and the variety of food items that you can get here. 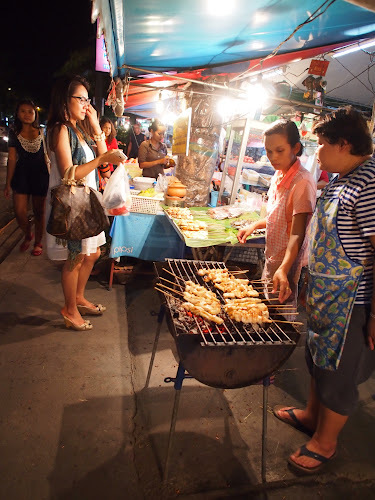 Bangkok is synonymous with good food and the street food culture. If there is room on a sidewalk, they will put up a stall. In fact, many of the street food scenes are located near colleges and universities. They serve relatively cheap food for starving students. In the meantime, the vendors earn money. For the most part in Thailand, there is no unemployment insurance. There are also no regulations or licensing. You can start a business with a cart in a day. Wages are low, but unemployment is also low. 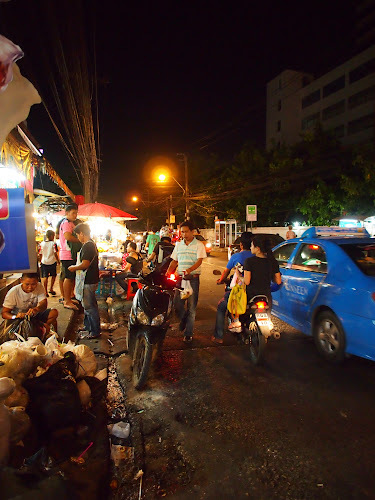 This is why the street food scene probably is very strong in Bangkok. Prime locations seem to be around the 7/11 and Fresh Mart areas. People walk into these places and buy a coke, or a beer to go along with the food being served up. Competition is fierce. You have to be the best to survive. So, what can you get? Let's see. You have fruit stalls. The bananas in Thailand are smaller. They are not the same size as the one's in the States. Also, you have fruit like longan, mango and other stuff. Every vendor pretty much is a specialist. They only do one type of dish. There may be variations, but generally, they are usually very specific. A noodle stall will focus on a type of noodle. Pork stalls will do the same. Duck stall will only deal with duck dishes. A view of the street shows that the vendors are also literally on the street. You have a sidewalk, but you can then pick your foods from both sides. By the way, this only begins to become active after sundown. Bangkok is known for its nightlife for a reason. The sunlight in Bangkok can be unrelenting, and many prefer to shop and to go out after sundown. 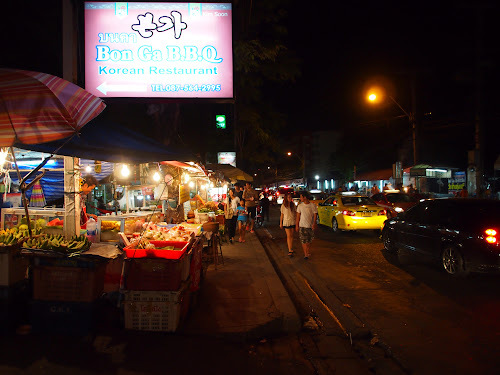 Both sides of the street have food vendors. The guys on the scooters wearing the orange vests, they are motorcycle taxis. 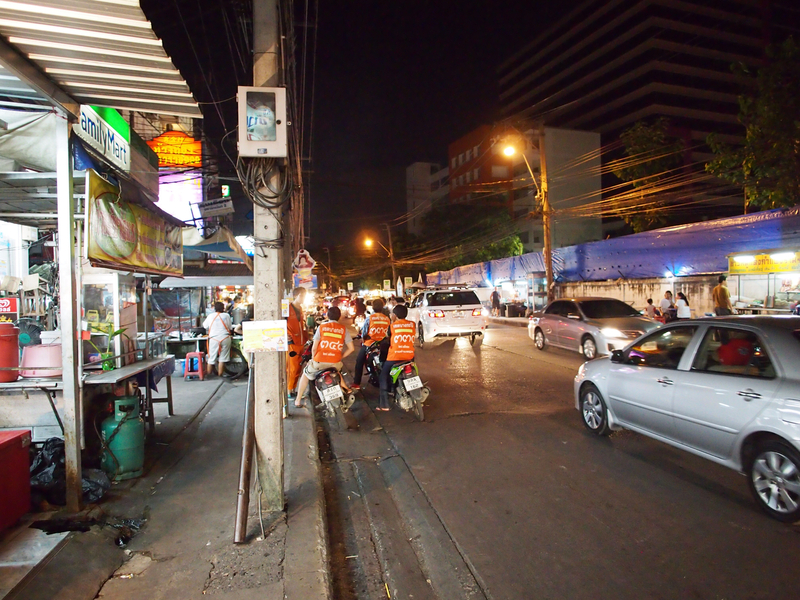 They will take you to a spot for about 10 to 20 baht. That's less than a dollar. I avoid them because they are sort of fearless with cars and going in the opposite direction of traffic sometimes. As you can tell, the space between one vendor and the vendors sitting in the street are very close. You will not see a food truck in this neighborhood. Number one--too big. Number two--Thailand doesn't have the food Nazis. In Los Angeles, the illegal bacon wrapped hot dog vendors run a cat and mouse game with the food police. The food police here are the customers. That sign on the concrete pole means, "Don't climb it!" If you know the wiring and infrastructure of SE Asia, that's good advice. There are a number of stalls that specialize in fried foods. Fried fish cakes, shrimp cakes and other stuff. There are also a number of stalls that have a variety of sausages and mystery meat. Thais also eat liver, kidneys, and other things that Americans tend to shun. I can't eat liver. Ever since I was a kid, I detested it. I think it was because of the texture. Side streets along the main street also are populated by stalls. In fact, you can't go anywhere without your senses being overloaded with food. In Thailand, they don't say, "How are you?" They say, "Have you eaten yet?" The servings are small. 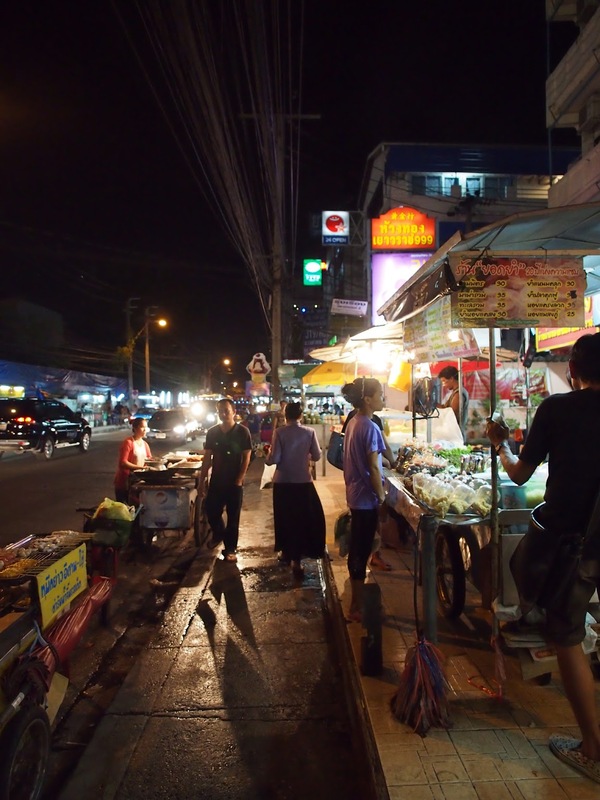 The prices will be around 30 baht per plate, which is about a dollar. At the end of the evening, piles of trash accumulate on corners. They still give out plastic bags here, so people use them up. You can get some flowers for your girl, and you can get some roasted fish. The street scene is so much more interesting sometimes. 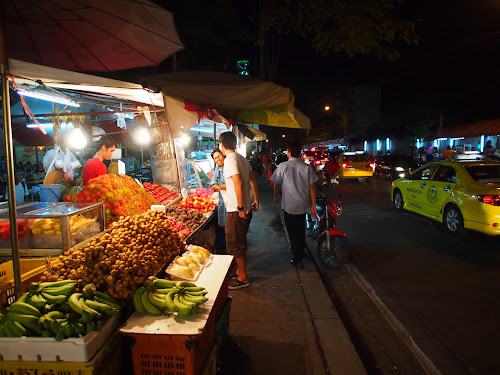 Unlike Los Angeles, there is a vibrant life on the streets of Bangkok. This is especially true in the Ramkhanhaeng area. There are things that you would want to watch out for. Because there are no food Nazis, you have to be very careful. If not, you can have a long day of Montezuma's Revenge. 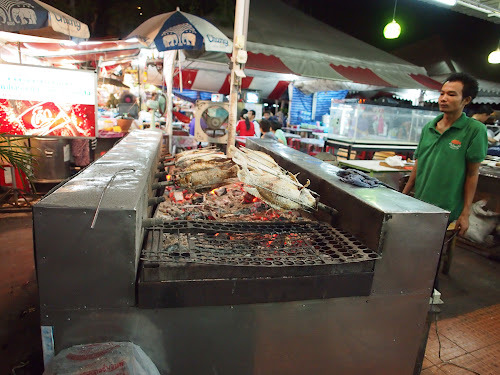 For example, grilled fish. You can get grilled fish for about 30 baht or about a dollar. That might seem like a bargain. Other fish might be 300 baht. 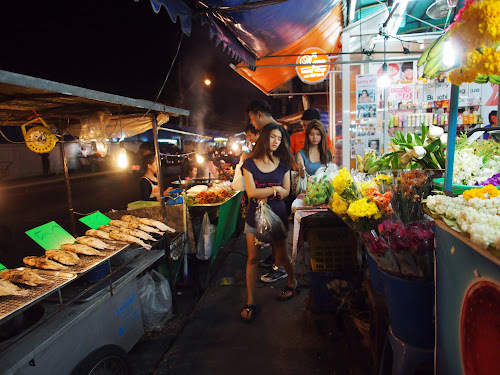 Get the 300 baht fish. It's been sourced from some more reputable companies like CP Group. You can ask, but it is better to have another Thai. Sometimes, you do get what you pay for. If you are careful, you can get some really good stuff. Grilled squid anybody? These must have been big, as the meat chunks are about a half inch thick. And no, they don't taste like a tire either. So, if you get a chance, check it out. 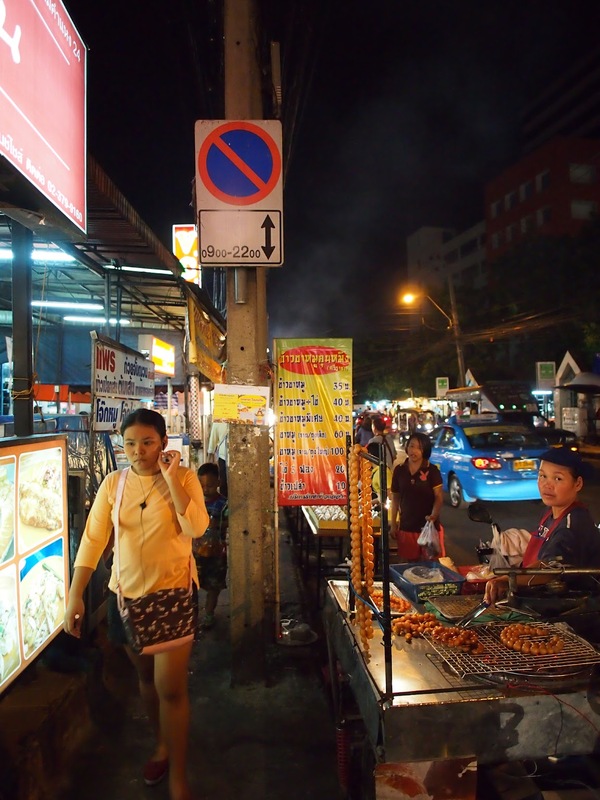 And by the way, if you so desire, you can have your grilled squid with a beer on the sidewalk next to the 7/11. No one cares.